Situated in Idaho's "Magic Valley," Red Lion Hotel Twin Falls is one of the most affordable pet-friendly hotels in Twin Falls, Idaho. Whether you're road-tripping through Twin Falls or stopping to check out the sights, make your stay at Red Lion Hotel Twin Falls a relaxing one in our comfortable accommodations. Red Lion Hotel Twin Falls also offers some of the most useful hotel amenities among Twin Falls, Idaho hotels including a modern fitness center, seasonal swimming pool, complimentary transportation to/from the Magic Valley Regional Airport, 4,952 square feet of event space, and on-site dining. Delight in our signature cuisine at Diamondfield's Lounge. Among Twin Falls hotels, Red Lion Hotel Twin Falls provides some of the best hotel amenities for Twin Falls, Idaho. Arrive to our hotel without the hassle of taxi fees in our complimentary airport shuttle. Sleep tight in one of our 112 pet-friendly accommodations and enjoy your stay with our fully-equipped fitness center, seasonal swimming pool, and delicious on-site dining. As one of the only full-service hotels in Twin Falls, we also provide professional catering services and 5,085 square feet of flexible event space that can accommodate up to 200 guests. We are now featuring a masseuse! Monday thru Saturday 6pm to 9pm. Contact front desk for reservations. One hour advance notice needed for same day reservations. Located near Shoshone Falls and other popular Twin Falls attractions, Red Lion Hotel Twin Falls offers several different dining options. If you are looking to watch the game or enjoy dinner and cocktails, visit our Diamondfield's Lounge and enjoy complimentary popcorn, flat-screen televisions, and a friendly round of pool or darts. Locally owned and operated sports bar and grill featuring hamburgers, wings, salads, & sandwiches. Don't forget to check out their famous fish tacos. Upscale-casual bar & grill offers inventive American dishes, an extensive salad bar, & cocktails. Perched atop the Snake River Canyon rim, Elevation 486 is appropriately named after its elevation level. With gorgeous views of both the canyon and the Perrine Bridge, this restaurant and bar is perfect for sipping a cocktail with friends against a particularly picturesque panorama. Rudy's is a downtown hub offering one-of-a-kind cooking classes and entertainment with wine and food tastings every first Friday of the month. This relaxing spot is the perfect place to grab a drink or try a 1/2 lb burgers. A local landmark since 1978, Rock Creek Restaurant is one of the best restaurants in Twin Falls for savory steak and seafood. Wine and dine in warm atmosphere with impeccable service and a 125-option wine list. Diamondfield’s Lounge blends fine Idaho cuisine with the casual atmosphere that can be found at most sports bars in Twin Falls. Watch the game on one of our many flat-screen televisions and enjoy complimentary popcorn or play a round of pool or darts while munching on delicious appetizers from our menu. Located in the heart of Twin Falls, Red Lion Hotel Twin Falls offers a convenient destination and 4,952 square feet of multi-faceted facilities for both business and social Twin Falls events. Host one of your Twin Falls events in one of our six venues -equipped with complimentary Wi-Fi, the latest A/V equipment, and enjoy easy access to many local businesses, restaurants and attractions. Let your attendees unwind in one of our 112 beautifully appointed accommodations with convenient amenities, such as complimentary airport transportation, parking and more. We offer six diverse Twin Falls event venues, so we can service any size party. Our Forest ballroom, with over 2,500 square feet of space, is ideal for large wedding receptions, lectures, or conferences. At 1,700 square feet, our Oak room can hold a slightly smaller event of about 150 people. The Cedar, Aspen, and Juniper rooms are ideal for mid-size events, hosting up to 80 people, while our Pine and Willow rooms are ideal for smaller meetings and groups looking for closer, more intimate venues. Each room is incredibly flexible, with seven different layouts to accommodate different varieties of Twin Falls events. The Theater and Banquet layouts offer the most space, while Reception and Rounds layouts can hold slightly smaller groups. A classroom layout focuses on a lecturer and their audience, and guests can use U-Shape and Conference layouts for more intimate events. As the only full-service convention hotel in the area, we also provide professional event planning and some of the best catering in Twin Falls. To inquire about hosting your Twin Falls events in one of the venues, call (208) 734-5000 and speak to one of our friendly sales associates today. As the only full-service hotel in the area, Red Lion Hotel Twin Falls provides over 5,000 square feet of multi-faceted event facilities as well as top-notch event planning and catering in Twin Falls, ID. Plan your events in Twin Falls with the assistance of our event specialists and treat your guests to tasty dishes from our signature menu. Whether you need snacks for a meeting or boxed lunches for a retreat, our professional Twin Falls catering team will suit all of your culinary needs. For further assistance and to plan your event, please call our catering director at (208) 734-5000. Hosting weddings in Idaho has never been easier. At Red Lion Hotel Twin Falls, our property offers ample space for every style of wedding, from a massive family reunion to an intimate gathering of close friends. Take advantage of 4,952 square feet of event space where our catering and event planners are at your service to craft an elegant, graceful experience that will leave every guest buzzing. We offer six diverse Twin Falls wedding venues. Our Forest ballroom, with over 2,500 square feet of space, is ideal for the largest wedding receptions. At 1,700 square feet, our Oak room can hold a slightly smaller event of about 150 people. Cedar, Aspen, and Juniper rooms are ideal for mid-size events, hosting up to 80 people. Finally, our Pine and Willow rooms are ideal for smaller meetings and groups looking for closer, more intimate venues. Each room has flexible layouts that can be customized to fit your exact needs. Located in the heart of Idaho’s “Magic Valley,” Red Lion Hotel Twin Falls is a convenient lodging option for guests seeking fun and adventures. Walk one of the highest bridges in the world over the Snake River Canyon and discover Shoshone Falls –a 212 foot waterfall cascading to Dierkes Lake. From top-notch whitewater rafting on the Snake River to skiing at Sun Valley, there are always things to do in Twin Falls, Idaho. When in town, make sure to check out some of our favorite Twin Falls attractions listed below or contact our front desk directly for more recommendations. Break a sweat at the Canyon Rim Trail, which offers up over 10 miles of trails along the Snake River Canyon and throughout Twin Falls. There's nothing quite as sweet as mom's homemade desserts. Revisit your favorite childhood sweets with any of the handmade confections, sandwiches and hand-blended milkshakes and malts served at this long-time local favorite. The Hagerman Area and Thousand Springs boasts sparkling waterfalls, bountiful summer melons, fish hatcheries as well as picturesque areas for camping, boating, bird-watching, and swimming. Located near Twin Falls and Boise, Miracle Hot Springs is a geothermal oasis equipped with a year-round pool and private tubs made of natural hot spring water. Shoshone Ice Caves is a natural wonder steeped in fascinating geologic, volcanic and historical facts. Go underground to explore the caves with a tour guide. The natural beauty around the city makes Twin Falls an outstanding destination for travelers. Within the city, you'll find great shopping, including nostalgic candy shops. Ten miles of adventure winds along Snake River Canyon and through Twin Falls. Pit stops allow you to refresh with food and drink. Savor the stunning views this trail offers as it passes along the Snake River and its gorgeous canyon. These handmade desserts, confections, sandwiches, and milkshakes give you a sweet sense of childhood nostalgia. Stop by for a treat at this long-time local favorite. The hot springs are a geothermal oasis in the middle of the desert that allow you to rejuvenate in its calming, relaxing waters. The natural spring water is soft to the touch and odorless, with a sensational alkaline pH of 9.6. Take a refreshing dip in these warm springs. Red Lion Hotel Twin Falls is located within easy access of some of the best Twin Falls restaurants and bars, including Rock Creek Restaurant, a local favorite local for juicy steaks, prime rib or seafood. Other must-taste options include Cucina Gemelli, serving Italian specialities mixed with local fare and Crowley's Soda Fountain and General Store, offering a classic soda fountain menu. Be sure to ask our friendly staff members for their own suggestions on the best Twin Falls bars and eateries nearby. Located the heart of Twin Falls, Red Lion Hotel Twin Falls offers the best rates among business-friendly hotels in Twin Falls, ID on 112 spacious accommodations with easy access to some of the best golf in Twin Falls. Tee off at Twin Falls Golf Course amid the majestic beauty of the Snake River Canyon or reserve your spot at Clear Lake Country Club, Jerome Country Club, or the city-operated Twin Falls Municipal Golf Course. Enjoy an authentic Twin Falls golf resort setting with some of the area's best courses –perfectly attuned for golfers of all skill levels. Contact our front desk for information on tee times. Just minutes from Red Lion Hotel Twin Falls, Perrine Bridge is a majestic sight. The four-lane bridge is approximately 1,500 feet long and hovers 486 feet above the Snake River Canyon. 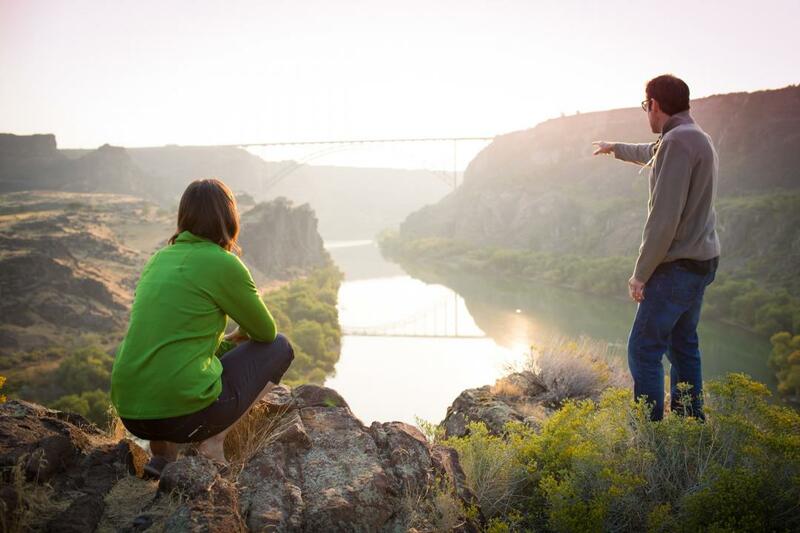 Come stay at our convenient hotel near the Perrine Bridge for premier access to one of the main attractions in Twin Falls. Perrine Bridge is a popular BASE jumping site, renowned all over the world over. The bridge is the only man-made structure in the country where BASE jumping is allowed year-round without a permit. Located at the southwest end of the bridge is the Twin Falls Visitor Center, where visitors can pick up souvenirs and gifts, Idaho products, tourism information and see interactive exhibits highlighting the activities and attractions in the region. BASE Jumpers often use the center as a home-base before and after parachuting from the bridge. The visitor center also offers spectacular views of the canyon, bridge, and easy access to the highly developed trail system along the canyon rim. Trails pass under the bridge on either side so you can view the iconic bridge from all sides of the canyon. Red Lion Hotel Twin Falls is the only full-service Twin Falls, ID hotel offering 112 pet-friendly accommodations with easy access to some of the top things to do in Twin Falls, ID. One of our favorite Twin Falls, Idaho things to do is hiking to the infamous Shoshone Falls. Known as "the Niagara of the West," Shoshone Falls is actually higher than Niagara Falls, cascading 212 feet to Dierkes Lake. Hike through the mighty Snake River Canyon and over the Perrine Bridge to discover the endless natural wonders of Shoshone Falls. Whether you're a prospective student or visiting family, Red Lion Hotel Twin Falls places you within easy reach of the College of Southern Idaho. In addition to boasting one of the most convenient locations among Twin Falls, ID hotels, we also provide 112 spacious accommodations and premium Twin Falls travel amenities at inexpensive rates. Lodge with us at one of the only full-service hotels in Twin Falls, ID and enjoy easy access to all the fun things to do on the Southern Idaho College campus –including Herrett Center for Arts and Science, the Fine Arts Auditorium, and the Faulkner Planetarium.